Welcome everyone, I have been enjoying talking to a few more listeners lately, always enjoy it – one cool chat I had was with Claire Chen over in London! She’s been working with East Meets West club and bridging Chinese and British business people, some similar things Global From Asia is doing so we had a great connection there. So now for this week’s show – today is USA election day, and there has been talk of friends saying how will America change after this one. It’s always awkward being in the midst of political debate for me, especially when living in China. Tell me about yourself and how your business relates with renunciations? What is a Covered Expatriate? 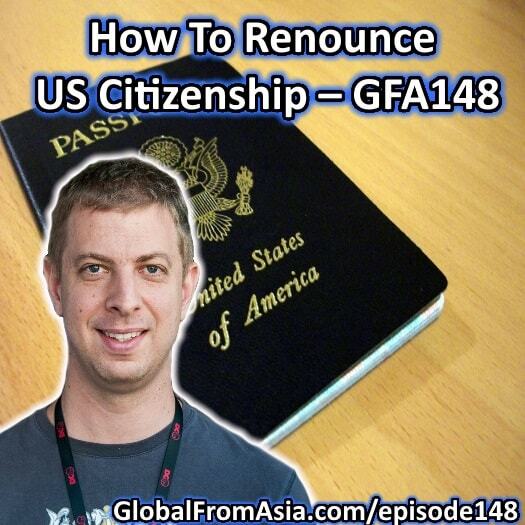 So, what is the difference between renunciations, surrendering and relinquishing US citizenship? Can I renounce without having any other citizenship? How many people do that every year? So the real cost of tax compliance exceeds the tax liability? What are the situations which cause people to have to file more forms and pay more in tax preparation fees? Thanks Olivier. He’s a professional at this and will answer all your questions. It is a scary process it seems, and you want to make sure you do it right. Thanks G for this deep reply. While I have been overseas almost 10 years now, not until I started doing this podcast and working with clients on company setup and bank accounts did I see this problem at scale. It is fascinating and scary at the same time. And yes, manufactured guilt that gets me emotional. Seems others have privately messaged me wanting to hear more about alternate citizenship as well. I have a few candidates and will work on this topic in 2017. Thanks again for listening and leaving an amazing comment back.